Review: After first teaming up with Uzuri back in 2016, Italian producer Giorgio Luceri finally makes a return with a second part of his Space Fire Truth series. There seems to be a concept lingering in the presentation of the music, but let's focus on the sounds themselves. "Collinder 69 Funk" is an effervescent burst of uplifting energy with a groove that feels housey underneath plush Detroit techno synths. "The Early Morning Ouroboros" switches things up with a pacey, chopped up broken beat trip peppered with soulful vocals and instrumentation. "Kepler 16b" is a moodier affair that lets the techno side of Luceri's sound bleed through, and then "Tu Sei Il Maestro Dell'Eterno Ritorno" finishes the record off on a stirring, romantic tip with swooning strings aplenty. 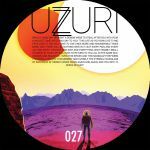 Review: REPRESS ALERT: Uzuri can always be trusted as an on-point barometer of the strongest currents in contemporary deep house, and here they welcome a new talent into their midst in the form of Panama Keys. "Panamarama" is a gorgeous suite of organic instrumentation, all Spanish guitar licks and pattering bongos, which then get handed over to the mighty Joe Clausell for the soaring, energised "Harvest Remix". "Vyrgin Island" may well be the stand-out track on the record with its infectious flute lines, chiming vibes and sensual, punchy bassline, but don't overlook the blissful ambience of final vignette "Flying Whiles".